During the first half 17th century the denizens of the ancient coastal town of Lowestoft in Suffolk, England, witnessed many upheavals their lives. Plague, fire, civil strife, a rapid decline in the local fishing industry and an expensive law-suit with the neighbouring town of Great Yarmouth all left their mark on this small community of under 2,000 souls. Then, in the year 1660 another "menace" appeared in their midst when, in the minds of some, the ugly spectre of "witchcraft" reared its head. 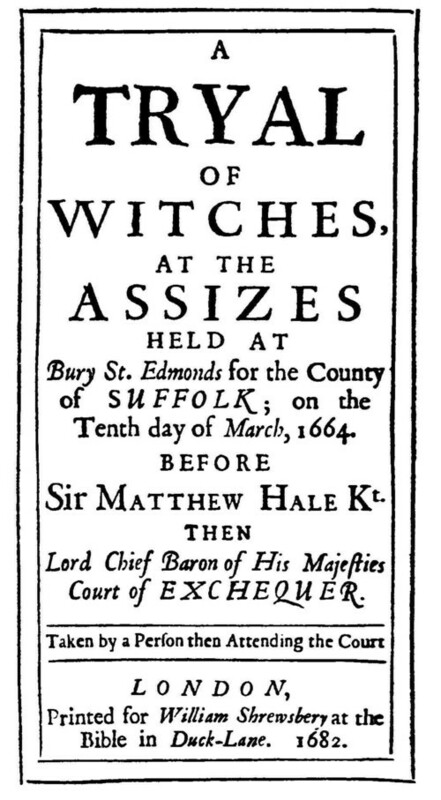 Two elderly widows, Rose Cullender and Amy Denny, were suspected of being "witches" - and after some months they were arrested, accused and tried at the Lent Assizes held at Bury St. Edmunds, Suffolk on March 13th 1662. Both were found guilty and hanged. The details of their trial and the accusations against them were recorded at the time and twenty years later published in a small booklet entitled "A Tryal of Witches". This trial is important in the annals of English witchcraft accusations for a number of reasons. Firstly, it was presided over by Sir Matthew Hale, Lord Chief Baron of the Exchequer. Hale, who later became Lord Chief Justice of England, has been eulogised as a man of "learning, wisdom, piety and virtue, which shone in his life which such transcedent lustre and raised him to the highest eminence". He is still honoured as one of the best minds in English jurisprudence - and yet, blinded by the beliefs of his day he still condemned two old women to death for crimes they could not have committed! Secondly, the published trial report, based on the notes made by an eye-witness, is probably one of the most comprehensive in England and gives a frightening insight into the way a witch trial proceeded. Thirdly, it is arguable that without the trial of the Lowestoft Witches and the publication of the trial report, then the infamous witch trials at Salem in 1692 might never have happened. Cotton Mather states that when the Magistrates at Salem were looking for a precedent in allowing so-called "spectral evidence" they consulted the Tryal of Witches booklet. Upon discovering that no lesser person than Sir Matthew Hale had permitted this evidence to be used in court, they to accepted its validity and the trials proceeded. In England, witches were tried as felons according to the Statute in force at the time. The "Lowestoft Witches" were tried under the Witchcraft Act of 1604. There were clearly defined processes and steps for bringing felons to trial and these can be clearly recognised in the Trial Report. 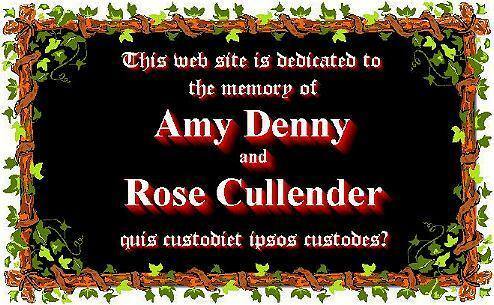 It is incredible to realise that Amy Denny and Rose Cullender were tried by the full "Majesty" of the English legal system, and that their case was heard by some of the most learned intellectuals in Law, Medicine, Science and Philosophy of the time - and yet despite this they were still found guilty of "crimes" it was impossible for them to have committed. Hindsight is always 20/20 but it is worth remembering that there is a lesson for us all when studying this trial . . .
As the "Tryal of Witches" pamphlet tells the story of the trial of Amy Denny and Rose Cullender in graphic detail, I have used it as the basis for this web site. Links in the dialogue will take you to details of characters, events, background . . . .
by Gilbert Geis and Ivan Bunn [Routledge, London, 1997]. This web-site was written and produced by Ivan A. W. Bunn, Lowestoft, Suffolk, England. All information copyright Ivan Bunn and Gilbert Geis.